The Data Moving Menu Control may be used to navigate among the virtual pages of a Single Page Application, too. In this step by step tutorial I will show you how to configure the menu control, and how to adapt it to the authorizations of the currently logged user . 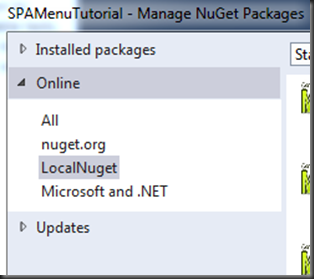 The full working code is available in the “ContextDependentMenu” file on this site and on the Data Moving Plugin Examples Codeplex site download area. 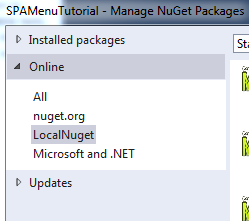 The Visual studio solution must be activated by installing the DataMovingPlugin5Examples.x.x.x.nupkg file you get with the product. 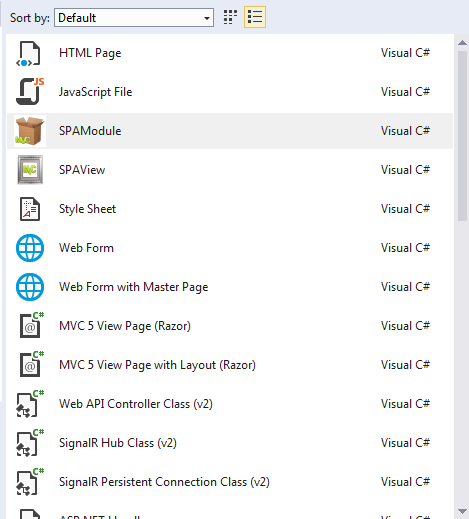 As a first step let select the SPA Mvc 5/WebApi 2 SPA project template in visual studio. 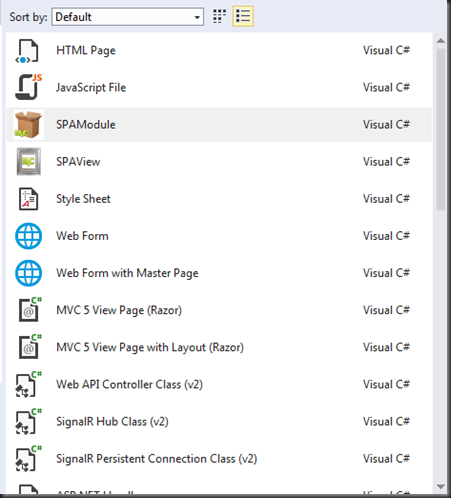 All SPA visual studio templates may be downloaded from the Data Moving Examples Codeplex Site. 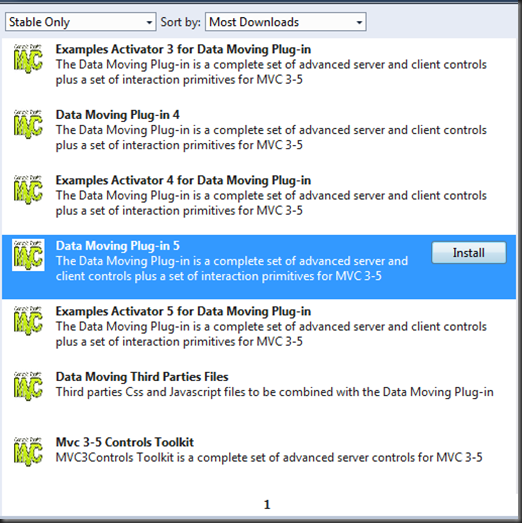 Now select the “Data Moving Plug-in 5”, and install it. An essential SPA with just an home page, and Login, Logout, and Unauthorized page is created. Application/MainJs. 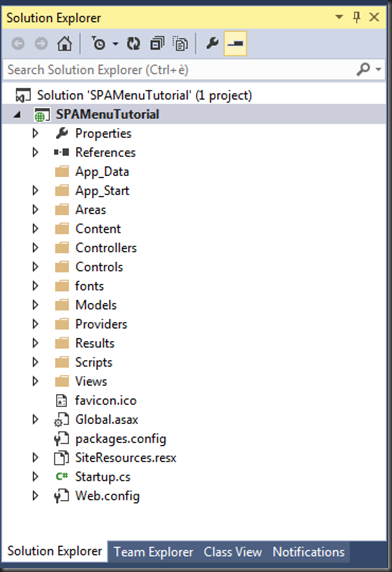 It contains the SPA start-up code and the definition of the application ViewModel. Without the addition of a theme the appearance of the menu we are going to build would be quite “bad”. Adapting the Menu to the current page and to the current logged user. The Models/ApplicationDbContext.cs file contains a Database seeding function that defines the “admins” role and two users: an administrator and a normal user. In an actual application we should modify this code to adapt it to our needs. In this simple tutorial we may use the default users and roles. username: admin, password: padmin, as shown in the previous video. Now, in visual studio, right click on the Views/Templates folder and select “new folder”. 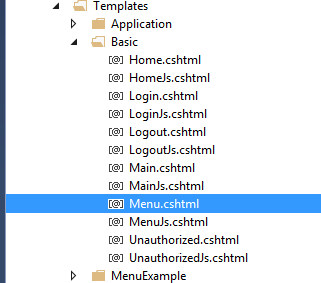 Name the new folder: “MenuExample”.This folder will contain all files of the new MenuExample SPA Module that we are going to define. Since ,as in most of the cases, we don’t need to modify the default routing rules you don’t need to modify Main, and MainJs. Now we may define all SPAViews. 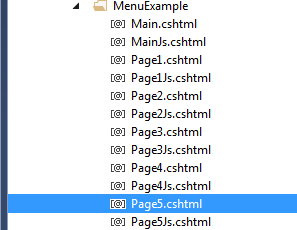 You don’t need to define a page ViewModel, since we will use all these pages just to test our menu. In this simple example we specified access rules for each single SPAView, but in more complex applications you may write also something like: AddTo(“MenuExample”, “*”), in which case the requirements apply to all SpaViews of the “MenuExample” module. Then, exceptions to this general rule may be applied to specific SPAViews. After you successfully login, Page4 appears. Wow! We need only a “smart menu” to navigate our application. 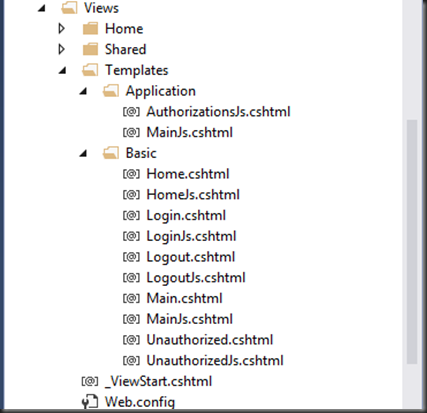 Each SPAView host is bound to an applicationModel Property. 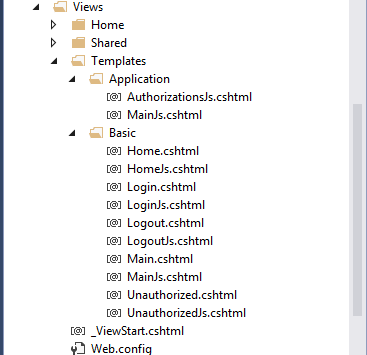 The initial application ViewModel contains just a single property, called MainContent, used by the main content SPAView host, shown above. mainAfterRender and mainbeforeRemove are applicationModel methods defined in Views/Templates/Application.MainJs.cshtml, that provide respectively content fade-in and content fade-out. We enclose the our main menu in a nav tag to improve the application accessibility. The Main Menu host doesn’t need fade-in, and fade-out capability, since it will never be removed, but only modified to adapt it to the context. In the case of a SPA we must supply a function that provides a custom interpretation of both Link and Target. In the simplest case a SPAView may be referenced with a string of the type <module name>.<view name> in the Link, while the host where to load the SPAView may be denotated by its index into an array of possible hosts. 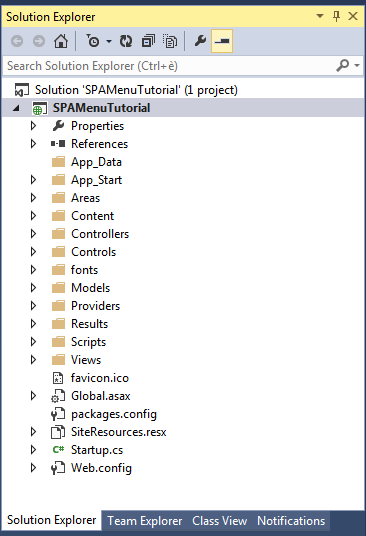 Standard Urls are processed first, otherwise we retrieve the SPAView specified in the action parameter from the default page store. The host where to place the SPAView is decided by interpreting the target argument as an index in the array of all application root hosts that is inserted in the _interfaces property of the Menu ViewModel. The Menu SPAView is not handled by any page store, since it will never be removed from its host. Now we must define viewModelContent to bethe object hierachy that contains all Menu information. We added also two sub-items that navigate to external pages. The above definitions must be appended to the Content/Site.css file. You may experiment by changing some of them. As a default sub-menus appear when the mouse hover their father menu item, but If the client device is a mobile device the call to ActiveOnlyOnClick() change this behavior, and sub-menus are open on “click” or “tap”. Then we declare which item property contains the target where to open links or virtual SPAView references, and the various menu items radiuses (see the picture that shows the three radiuses here ). The way each menu item is rendered is defined by two templates, that are configured inside two AddRowType()-EndRowType() blocks. 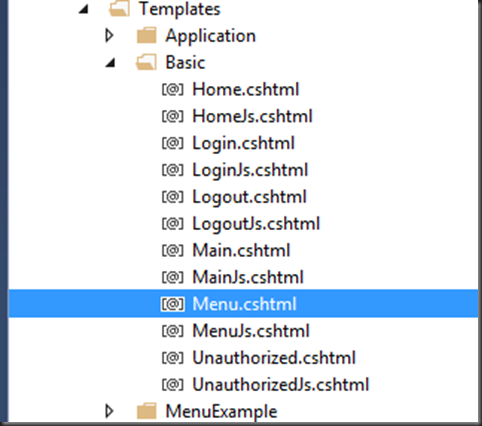 Both templates are based on the default menu row template, since no custom row template is defined, and both of them have an unique column that shows the menu item title. Each menu item title is contained in the Text property of the underlying data item. The addition of the GenericClasses.NoWrap Data Moving predefined Css class prevents menu item titles from wrapping. The only difference between the two templates is the ChildCollection call in the second declaration, that causes the recursive rendering o all children sub items contained in the children property. The two AddRowType blocks define two knockout client templates. Their names are obtained by adding the postfixes ‘0’ and ‘1’ to the template base name “Basic_MenuItem” declared with TemplateBaseName. It is good practice to give name of the type <module name>_<a name> to all client templates used by controls declared inside SPAViews. The first template is used for the menu items that can’t have children (their Children property is a null observable) while the second template is used for the menu items that may have children (their Children property is a possibly empty observable array). The selection of the right template is performed by the template selection function declared with TemplateSelector. In our case the function is declared on line, but it may be also the name of a SPAView ViewModel method. CustomNavigate declares the custom navigation function we have already defined in the MenuJs file. That’s enough to see the menu working! Run the application and enjoy your first Data Moving SPA Menu! 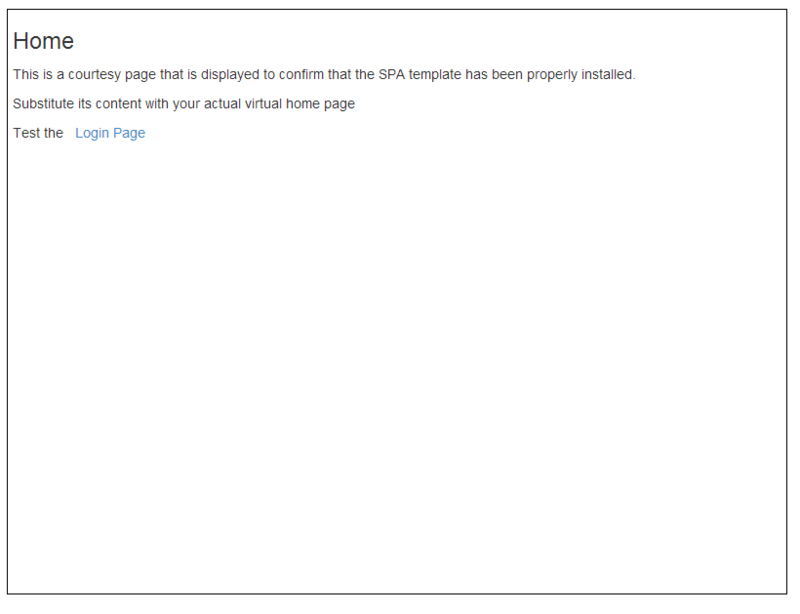 The menu item that connects to the actual SPAView that is in the main host must appear in a “selected state”. authorize(), that adapts the SPAView (our menu SPAView) to the authorizations of the current user. 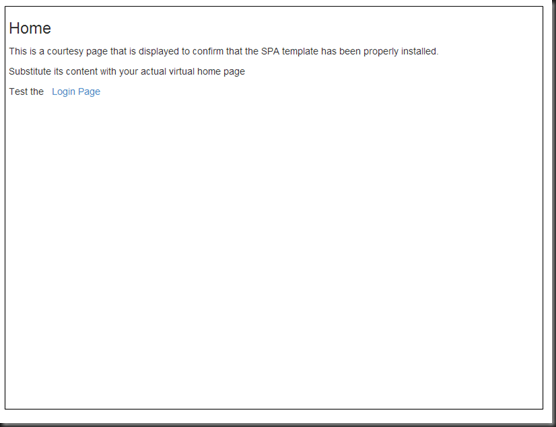 select(x), that informs the SPAView (our menu SPAView) that the SPAView x is currently in the main host. Where x is a string with the same format of the Link property of our menu data items. We define a IContextDependent resource handler with methods to register and unregister IContextDependent implementations for being properly handled by the application. Each time a SPAView that implements IContextDependent, is loaded it registers itself to the IContextDependent resource handler, and then it unregisters itself when it is unloaded. Whenever the current user changes, the IContextDependent resource handler is notified and calls the authorize() method of all registered IContextDependent implementations. Whenever the current SPAView in the main host changes the the IContextDependent resource handler is notified and calls the select(x) method of all registered IContextDependent implementations. The if checks that the module and view properties are actually defined, otherwise a null value passed to the select method simply de-selects any previously selected SPAView. @* Code here is executed each time the page is loaded. Both methods call two private recursive functions that traverse the menu data items hierarchy to do their job. The currentSelected private variable contains the menu data item that is currently selected, if any, otherwise, null. If a null action is passed, currentSelected is set to null and any previously selected menu item is unselected by calling mvcct.html.menu.selected(currentSelected, false). Otherwise the recusive selectMenu function tries to locate a menu data item matching the action string. If such a data item is found the menu item it is bound to is set in the selected state by calling: mvcct.html.menu.selected(item, true) and the data item itself is returned in the res variable, so it may substitute the previous currentSelected. If the selectMenu recursive search fails, null is returned in res, and any previously selected item is unselected by calling mvcct.html.menu.selected(currentSelected, false). The authorize method immediately calls the recursive private function authorizeMenu passing it the current authorization manager, and the level 0 menu data items. The authorizeMenu function traverses the menu data items hierarchy and checks possible links to SPAView against the authorization manager to verify if the SPAView may be accessed by the current user. In case the SPAView referred by a menu data item cannot be accessed by the user, the data item rendering is prevented by setting its _destroy property to true. If a menu item x has the only purpose of showing its children sub-items, and if all its children have _destroy set to true also the _destroy property of x is set to true, since it is completely un-useful. It is worth to point out that each time we make invisible a menu item we call the mvcct.ko.unfreeze to release any possible cached template, since most of Data Moving controls cache templates to improve performance. Where background-color must match “selected color” that in the case of bootstrap is the “alert-info” Css class background-color. In this case the “selected color” on the menu item linking to “Page 4” becomes visible only if you hover the yellow-border “private area”. You may also add a breadcrumb and modify the menu select method to update the breadcrumb, too. That’s all for now! 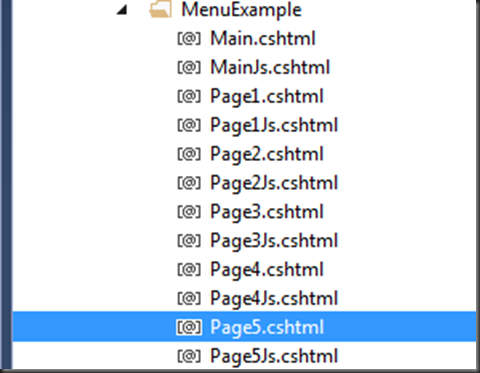 The full code is available in the “ContextDependentMenu” file of the Data Moving Plugin Examples Codeplex site download area. 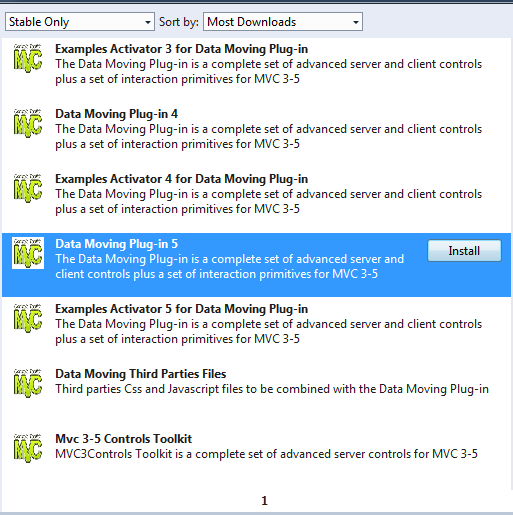 The Visual studio solution must be activated by installing the DataMovingPlugin5Examples.x.x.x.nupkg file you get with the product.